I have a confession to make. I read 13 Little Blue Envelopes a few years ago. I was enjoying it so much and was so curious to see what was going to happen that I flipped to the end of the story. This is almost always a bad idea and 13 Little Blue Envelopes was no exception. Knowing the ending took away the book's magic and I soon lost interest. I just skimmed the last third of the book. Still, I remembered it positively enough that I picked up The Last Little Blue Envelope. I was reading an e-copy of this book, which thankfully makes it much more difficult to skip to the end. I'm so happy I gave the sequel a chance. I loved it! Love, love, loved it! The Last Little Blue Envelope had all the elements that you want in a book: a great setting (all over Europe), well-developed characters, consistently moving plot, romance (especially romantic tension), and more. I began this book in a blind rage. A boy (Oliver) found the thirteenth envelope that Ginny lost at the end of 13 Little Blue Envelopes. When Ginny flew to London to reclaim it, everything becomes really complicated. I love that the book instantly evoked such emotion. I was ready to strangle Oliver. I actually had to put the book down for awhile - I was so upset. Ginny ends up going on a trip around Europe over Christmas break with three other people, one of whom is Keith - her sort-of boyfriend. I loved the character development in this book. Ginny is still sort of a blah character, although she has much more courage and backbone after her experience the previous summer (well, maybe not that much more backbone). It's the boys who really intrigued me. Keith becomes a much more layered person, in ways both good and bad, as Ginny spends more time with him. Until now, the reader saw Keith through the same rose-colored glasses as Ginny. Now it becomes more complicated. Oliver, the boy who found the note, also starts out as a very one-dimensional character - at least in Ginny's eyes - and slowly evolves into something more. It's hard to say much about the plot of this book, because I don't want to reveal too much. I even worry that the little I've said thus far about Ginny, Keith, and Oliver is too much. Usually, I'm not that worried about discussing the basic plot, but even the beginning of this book is very important to the overall story. I love that the story moves so quickly. The group travels around Europe once again, but it feels much different than in the last book. Different things happen in each location, so it doesn't feel like it's repeating itself. It's not just the different activities that the group is doing that's interesting. My favorite part of the book was seeing how the characters' actions increasingly revealed their flaws and strengths. Relationships strengthened and weakened. While it's a very plot-driven story, I think it's the characters that really make it fantastic. You could argue that the end was a little...not unrealistic, per se...perhaps contrived. That's not quite right either. I can't put it into words, but some of the things the characters did at the end were a little too cleaned up and perfected. Otherwise, I don't have any problems with this book. 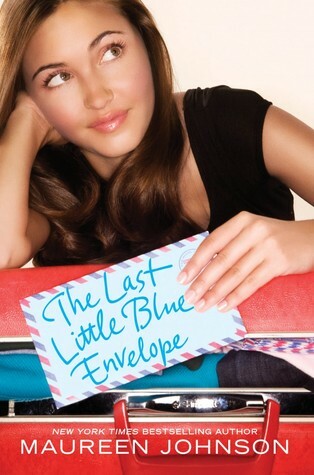 I highly recommend The Last Little Blue Envelope. It moves so quickly and you become to attached to the characters, that you won't be able to put it down. I want to go and re-read 13 Little Blue Envelopes now. I just adored this book. Gah, I just can't believe you would skip to the end of a book like that! That is such a no-no for me. I'm not surprised that that ruined the book for you, because I would feel the same. Anyways, the book sounds fab; I really ought to read more contemporary. I hope you enjoy 13 Little Blue Envelopes more on your reread! I sometimes feel that it can be sometimes a little bit unrealistic too! Ginny is really not much of an interesting character though. I mean it's such I great idea and all of the potential is kind of going to waste... if you know what I mean! Anyway, good luck on your reread! I really need to read 13 Little Blue Envelopes! I have the Kindle edition so I won't be too tempted to skip to the end :) Great review! Great review. This series is just so much fun. I agree with you on the 'too happy' ending, but it did not bother me too much. Yay! I'm glad you liked this one. I really enjoyed it too even though I hadn't read the first book in forever! I really enjoyed 13 Little Blue Envelopes. I can't wait to read the sequel, although I feel that I should re-read the first book before I do so. Great review! I have yet to read this series, but now I need to. I loved how you described the character development. Sound good. Great review! Awesome review. I started the first book but lost interest half way through, but I may try it again! I liked the first book, but I actually thought it ended perfectly. I like the idea of one envelope always remaining a mystery. Still, I'm interested to read this and see what Maureen Johnson does with the story. I think I get what you mean about the ending. It happens sometimes when the author wants to leave you with a HEA of sorts. I already have the first book, I just need to move it up on the old TBR pile. Ahh I have to read the book before this one now! Great review! So glad that you enjoyed it! I also read "13 Blue Envelopes" a few years ago and remember enjoying it. I was actually surprised there was a follow up. I thought the first book was fine as a standalone, but I'm happy to hear that it's worth the read. I haven't read this series, but I've hears some pretty awesome things about it. Great review, Alison! I've never heard of this one but itsounds really cute and I am all about a cute/fast read! I haven't actually read 13 Little Blue Envelopes, but the premise sounds interesting. And Maureen Johnson is an absolute sweetheart, so I'm definitely going to add this to my TBR pile. Thanks for the rec! I have not heard of either of these but am adding them to my TBR now. Thanks for the great review Alison!